nanim.proto, the format specification using protobuf : with protoc or other protobuf compiler, you can generate parser for about every popular programming language. Nanimstudio, the visual animation editor. Nanim SDK, command line tools. nanimjs, an html5 example player. Other softwares that support the nanim file format (like the drawing program pixeditor). Click here to download nanimstudio and nanimsdk 1.3 installer (make sure java is installed on your computer). 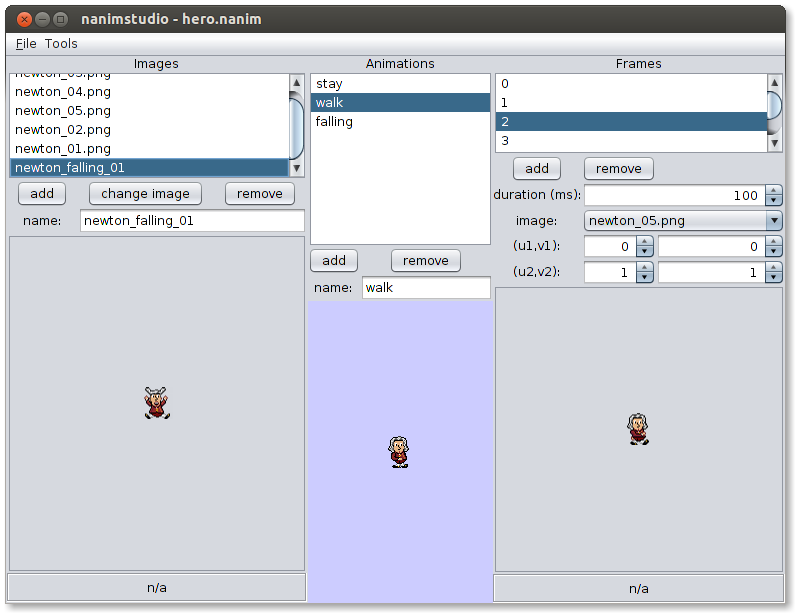 nanimstudio is free (BSD license) cross platform (Linux, Mac, Windows) graphical tool to edit nanim files. It also support gif, apng and spritesheets. The format specification using protobuf : using protoc or other protobuf compiler, you can generate parser for about every popular programming language. nanimenc, a tool that allow to create a nanim file from a list of png files. nanimdec to do the inverse operation: extracts png images from a nanim file. nanimls to dump nanim file infos. nanimopt, an optimizer program that use a bin packing algorithm to store the image in an opengl compliant format (minimum number of image with power of 2 dimensions). nanimview, a viewer to show nanim encoded nanimations. gif2nanim to convert existing gif animations. nanimmerge to merge multiple nanim files into one. nanimrename to change animation or image names. sheet2nanim to convert existing sprite sheets. font2nanim to generate font textures.